Marine Corporal Jacob Romo was on his first deployment when he sustained the traumatic amputations of both of his legs and right hand injuries in an improvised explosive device (IED) blast in Sangin Valley, Afghanistan on Feb.11, 2011. While on a dismounted patrol in the middle of farm country in the Helmand Province in Afghanistan, Cpl Romo stepped on a buried IED as a thunderstorm moved through the area. The mud and rain muffled the explosion and may have even saved Jacob’s life. Conscious throughout the ordeal, Jacob knew immediately that both of his legs were gone. Lifesaving measures by his comrades helped to stabilize him for a medical evacuation by helicopter. Airlifted to Camp Bastion, Cpl Romo was treated for his severe injuries before being flown to Landstuhl, Germany where he remained for a week. Arriving stateside, Cpl Romo spent six weeks at the National Naval Medical Center in Bethesda, M.d., before transferring to Balboa Naval Medical Center in San Diego where he received treatments and therapies for nearly two years before returning home to Tennessee. Now medically retired, Jacob enjoys spending time with his wife Michelle and their children. A member of the Whitten Memorial Baptist Church, Jacob enjoys self-education as well as teaching others. An advocate and mentor for Veterans, he looks forward to opening his home to any service members who are in need of a compassionate ear. 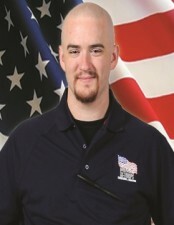 Jacob is affiliated with the Association of Defensive Shooting Instructors, Krav Maga Worldwide, and Dojo of the Four Winds (an ancient Martial Arts study). Cpl Romo would like to thank all of the donors and volunteers who support Homes For Our Troops. “We are so grateful for this opportunity. I am a big believer in self-empowerment and investing in people. This home allows us the means to pay it forward to other Servicemembers as well as those in our community. We will be able to more effectively help more people in the future. Thank you,” he says.